Global Racing Kart-2 is a specially blended 100% synthetic based lubricant for the use in high RPM two stroke pre- mix fuel. GRO has blended with the addition of Castor oil to give one of the most advanced two stroke Kart oil in terms of film resistance, protection and load capacity. Kart-2 has been developed to withstand the most severe conditions as well as being able to burn clean and leave minimal carbon deposits allowing maximum performance. 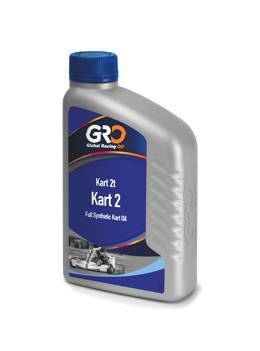 Kart-2 is formulated to enhance the performance of high performance two stroke kart engines by reducing friction of internal parts and providing clean combustion for better efficiency of the engine and can be mixed with fuel at a ratio from 3% to6% keeping the octane rating of fuel to a maximum.